Mexico; 2Department of Clinical Pathology, Robert-Bosch-Hospital, Stuttgart, Germany. tation and prognosis are controversial; we present the morphological and immunophenotype changes of this variant. 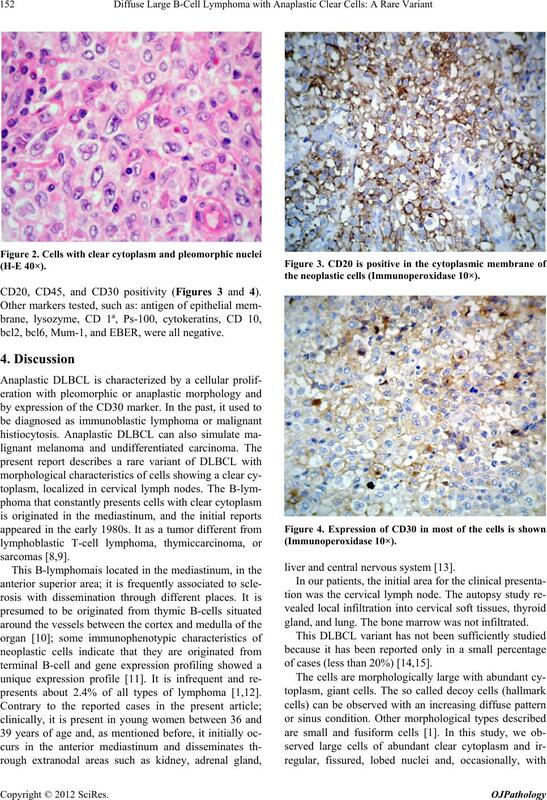 The differential diagnosis from other clear cell neoplasms should be made. nized by its expression of the Ki-1 antibody, now CD30. with the B immunophenotype . this variation with cells that present a clear cytoplasm. utes in a pressure cooker. CD1a (DakoCytomation and PS100 (DakoCytomation). convulsions, and died. Autopsy was done. lungs. The rest of the organs were found irrelevant. CD20, CD45, and CD30 positivity (Figures 3 and 4). bcl2, bcl6, Mum-1, and EBER, were all negative. 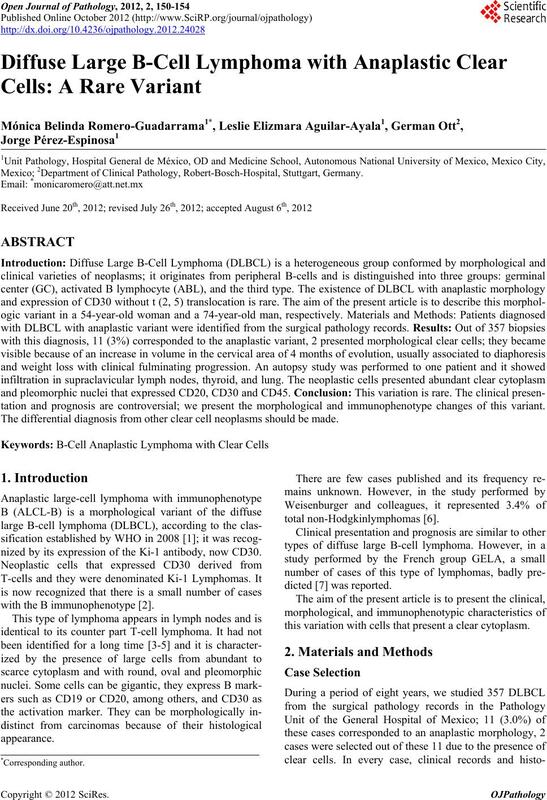 presents about 2.4% of all types of lymphoma [1,12]. the neoplastic cells (Immunoperoxidase 10×). liver and central nervous system . gland, and lung. The bone marrow was not infiltrated. of cases (less than 20%) [14,15]. that this variant corresponds to the so-called third type. ated with the presence of this virus. have a relevant role in the differential diagnosis . Epstein-Barr virus and with fulminant clinical course. H. Stein, R. A. Warnke, W. C. Chan, E. S. Jaffe, J. K. C.
Edition, WHO Press, Lyon, 2008, pp. 233-237. 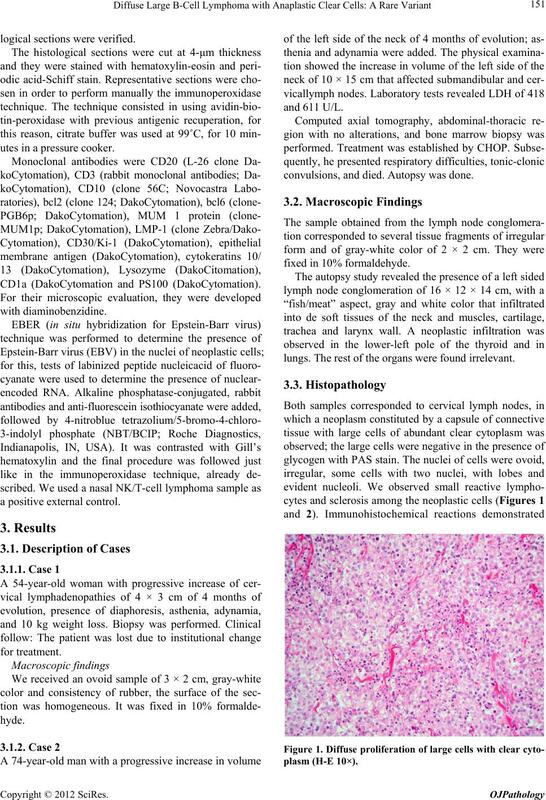 T. Kuze, N. Nakamura, Y. Hashimoto, M. Abe and H.
Japanese Population,” Journal of Pathology, Vol. 180, No. M. Engelhard, G. Brittinger, D. Huhn, H. H. Gerhartz, P.
Prognostic Risk Factor,” Blood, Vol. 89, No. 7, 1997, pp. Outcome,” Blood, Vol. 90, No. 9, 1997, pp. 3727-3734. 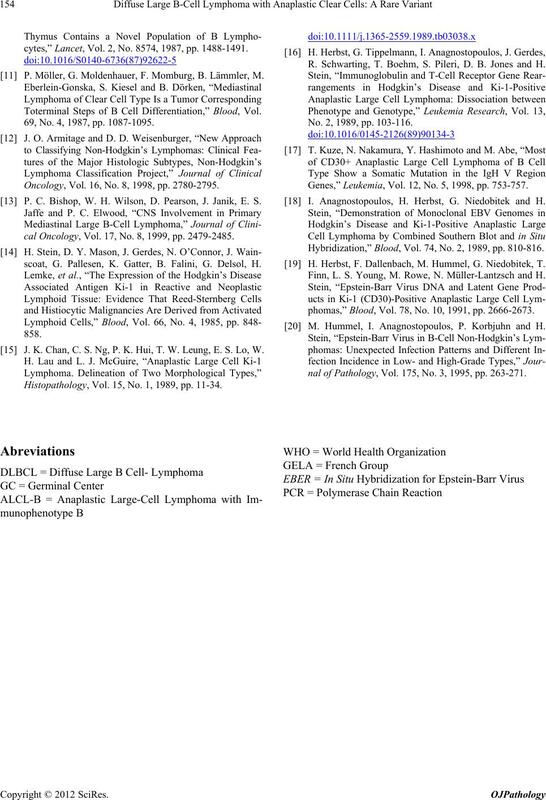 D. D. Weisenburger, J. R. Anderson, J. Diebold, R. D.
Gascoyne, K. A. MacLennan, H. K. Müller-Hermelink, B.
cation,” Leukemia & Lymphoma, Vol. 43, No. 1, 2002, pp. H. G. Zhuang, G. Z. Liang, W. C. Li, Y. Q. Zhang, R. Z.
thology, Vol. 19, No. 7, 1988, pp. 760-765. P. Möller, B. Lämmler, M. Eberlein-Gonska, G. E.
Histopathology, Vol. 409, No. 1, 1986, pp. 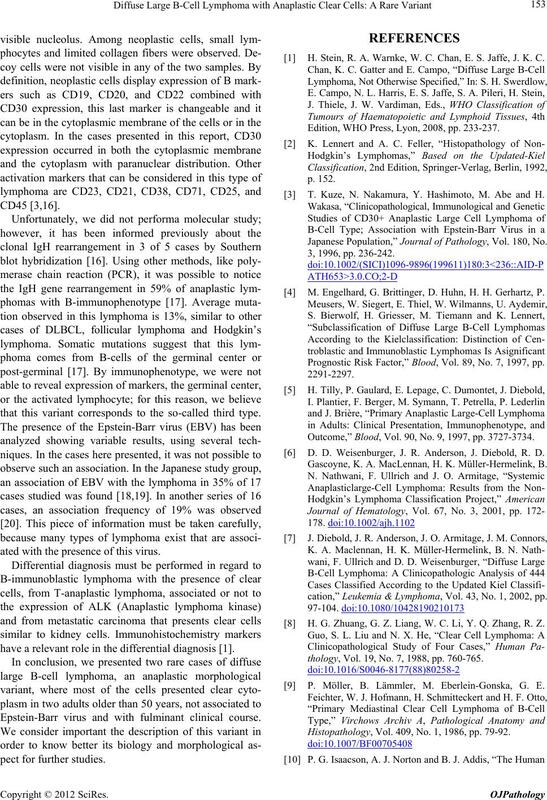 79-92.
cytes,” Lancet, Vol. 2, No. 8574, 1987, pp. 1488-1491. P. Möller, G. Moldenhauer, F. Momburg, B. Lämmler, M.
Toterminal Steps of B Cell Differentiation,” Blood, Vol. 69, No. 4, 1987, pp. 1087-1095. Oncology, Vol. 16, No. 8, 1998, pp. 2780-2795. P. C. Bishop, W. H. Wilson, D. Pearson, J. Janik, E. S.
cal Oncology, Vol. 17, No. 8, 1999, pp. 2479-2485.
scoat, G. Pallesen, K. Gatter, B. Falini, G. Delsol, H.
 J. K. Chan, C. S. Ng, P. K. Hui, T. W. Leung, E. S. Lo, W.
Histopathology, Vol. 15, No. 1, 1989, pp. 11-34. R. Schwarting, T. Boehm, S. Pileri, D. B. Jones and H.
No. 2, 1989, pp. 103-116. Genes,” Leukemia, Vol. 12, No. 5, 1998, pp. 753-757. I. Anagnostopoulos, H. Herbst, G. Niedobitek and H.
Hybridization,” Blood, Vol. 74, No. 2, 1989, pp. 810-816. H. Herbst, F. Dallenbach, M. Hummel, G. Niedobitek, T.
Finn, L. S. Young, M. Rowe, N. Müller-Lantzsch and H.
phomas,” Blood, Vol. 78, No. 10, 1991, pp. 2666-2673. M. Hummel, I. Anagnostopoulos, P. Korbjuhn and H.
nal of Pathology, Vol. 175, No. 3, 1995, pp. 263-271.